Here you can find a short summary about every presenting company and the date/time when you can watch the presentation live. I also added some links to online resources. There you can find deeper information as my summary is written really general. 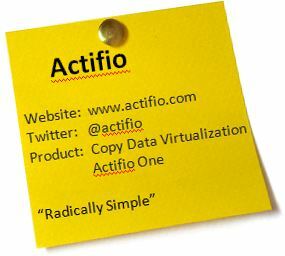 Actifio’s solution is all about data management. They have the vision of “Data Virtualization” and compare it with the advantages of the positive effects we all know from good old “Server virtualization”. With server virtualization it was possible to eliminate multiple, underutilized, redundant machines. “Data Virtualization” should eliminate multiple duplicate data sets. To reach this goal, the software non-disruptively captures data at the block level from production applications like Oracle DBs and apps, Microsoft SQL, Exchange, SAP and much more. In a next step, a “Golden Master Copy” is created, which is then updated on an incremental forever basis from source production applications. This Master Copy can be used to clone, live clone, mount, and restore data. It also allows you to test and prove disaster recovery plans as often as needed without disrupting production systems. With the product “Actifio One“, the company also offers a cloud-based application resiliency service to protect and recover physical and virtual machines and act as an application data vault in the cloud. A key feature of Actifio One are predefined recovery plans, that allow the customer to execute recoveries of specified servers in the cloud on a self-service basis on-demand. With these solutions, Plexxi enables customers to build an application defined network that can handle the explosive growth of traffic in private and public clouds. Plexxi Control and Plexxi Connect are software-defined networking solutions, so let’s take a look at Plexxi Switch first. 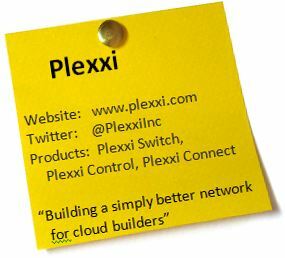 The new Plexxi Switch 3 is a powerful physical switch developed by Plexxi, that is capable of delivering up to 100 GbE connectivity. What makes this device special is that it is using high-speed fiber optic interconnections to communicate DIRECTLY with other Plexxi switches. This means that optical signals are not “switched” from switch to switch as in a traditional architecture in order to connect two devices. In this solution the devices communicate directly with each other because the switches in between are able to passively pass the signal through if it is not intended for itself. With Plexxi Control, the company delivers a product for automation, orchestration, control and visualization. The physical switches appear as a pool of resources and Plexxi Control provides a single point to monitor, manage and optimize the network. As it is resource and application aware it can optimize/tune network traffic based on the application. The third product is the Plexxi Connect Open Integration Platform. This year in March, Plexxi announced a suite of new product capabilities for this platform, delivering a workload-responsive and programmable network fabric for converged infrastructure and storage environments. As far as I know Plexxi will present and demo about Plexxi Control 2.2 at #TFD11 – so I am looking forward learning more about it in Boston. I am also looking forward hearing some customer success stories based on the products of Plexxi, maybe in combination with the co-existence of existing networking equipment. I do not come from the networker side, but I know that it is very often not desired by the network teams and a long way, to change a switch vendor.